WR Martavis Bryant vs. CB Johnathan Joseph – Antonio Brown will miss his first game this season and only the sixth of his career in Week 16 against the Texans, resulting in an expanded role for Bryant. Bryant is coming off his highest-graded game of the season with an 82.7 overall. 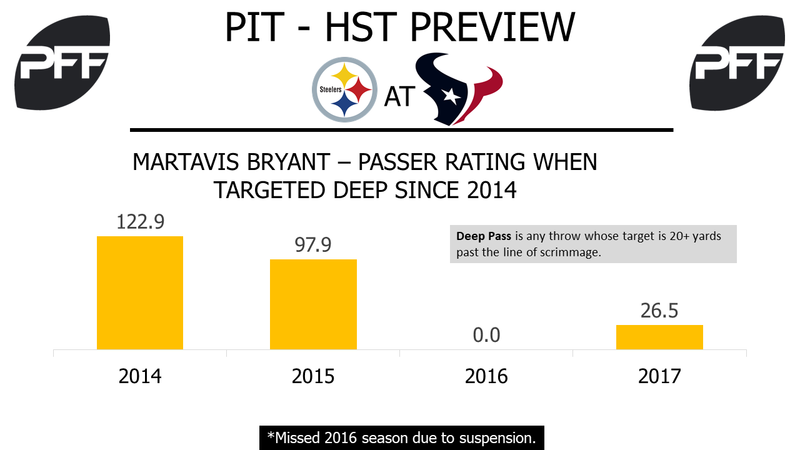 But where the Steelers may miss him the most is in the deep passing game. Brown has accounted for 63.6 percent of the teams’ deep receptions and 55.3 percent of their deep receiving yards. Bryant earned a passer rating of 111.5 when targeted deep from 2014-15 with seven touchdowns to one interception. But in 2017, Bryant has only a catch rate of 15 percent and a passer rating of 26.5 when targeted deep. Joseph may be able to help Bryant recreate his pre-2016 form, this is the first season Joseph has allowed a passer rating over 100.0 since joining the Texans in 2011. Joseph’s four touchdown receptions allowed in coverage are more than his previous two seasons combined. RB Le’Veon Bell vs. LB Zach Cunningham – Bell has been the Steelers’ workhorse all season long but with the loss of Brown and Bell’s backup, James Connor, the team will probably feed Bell even more. He leads all running backs with 898 offensive snaps in 2017, 172 more snaps than the next highest player. With 387 touches, Bell has fought hard to gain his yards with a league leading 785 yards after contact and has the second-highest missed tackles forced total with 42 this season. Bell has run even harder in the red zone, only 11 of his 58 red zone rushes have not resulted in yards after contact. Cunningham can hold his own in run defense, with an 86.0 run-defense grade, 14th in the league, and a 9.3 run-stop percentage that is the sixth-highest among AFC inside linebackers. But the rookie has struggled in coverage with a coverage grade of only 44.2 this season. TE Jesse James vs. S Marcus Gilchrist – In the past two weeks, James is tied for being the fourth-most targeted tight end in the league with 17 targets and is second at the position with 85 snaps in route during that span. He has the team’s highest passer rating when targeted within 10 yards of the line of scrimmage this season at 108.9, above even Brown or Bell. Gilchrist has covered the tight end position more than any other Texans defender, only to allow a passer rating of 118.3 to the position. QB T.J. Yates vs. Edge T.J. Watt – Yates started for the Texans last week in place of an injured Tom Savage and figures to finish out the rest of the season. Last week the Jaguars defense was a far from ideal draw and the problem remains the same for this Steelers group. Of his 64 dropbacks the past two weeks, Yates has been pressured on 44.6 percent of them, the third-highest rate in that span. His passer rating of 27.8 in those scenarios ranks 32nd among 34 eligible quarterbacks over that time. Watt’s pass-rushing productivity of 9.6 currently ranks fourth among rookie edge rushers. Over the past five weeks, that number has risen slightly thanks to 15 total pressures, so it’s likely the two T.J.’s will get acquainted with each other on Christmas day. 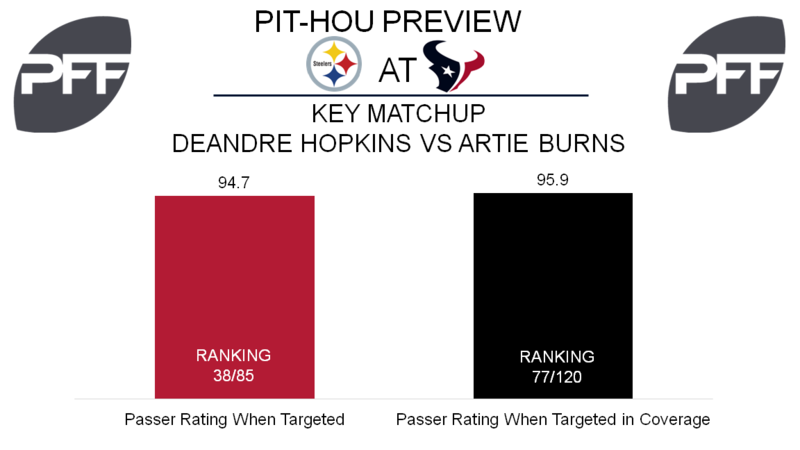 WR DeAndre Hopkins vs. CB Artie Burns – Hopkins has demonstrated the rare ability to put up numbers regardless of who is throwing him the ball. His overall grade of 89.4 ranks fourth among receivers and he has remained extremely efficient with 2.39 yards per route run, the fifth-highest mark at the position. Primarily lining up on the left side, Hopkins figures to line up often against Burns. Burns’ overall grade of 72.7 is a slight dip from his rookie season and ranks 71st among corners. Part of that could be due to a five week stretch where he has allowed a passer rating of 109.1 when targeted in coverage. The Texans have shown that they trust Hopkins against any corner if given single coverage, so another day of 10 to 12 targets seems likely. WR Will Fuller vs. CB Joe Haden – Fuller returned from injury in Week 14 and hasn’t yet been able to show off his big play ability. In those two games, Fuller is averaging 0.9 yards per route run and has been targeted on just nine of his 78 routes run. This figures to be a nice opportunity to try some vertical shots to Fuller, as he’s slated to square off against Joe Haden, who is expected to start immediately in his return from a broken fibula. Before the injury, Haden was showing signs of his old self, allowing 0.85 yards per coverage snap and a passer rating of 73.1 when targeted in coverage. Only one of Fuller’s targets since returning has traveled 20-plus yards in the air and in a matchup where Haden could be vulnerable, that’s something the Texans are likely to change.